I saw this sweet yellow suitcase at The Land of Nod opening party and thought it would be just right for Avery--she loves packing bags with her favorite things to go places. 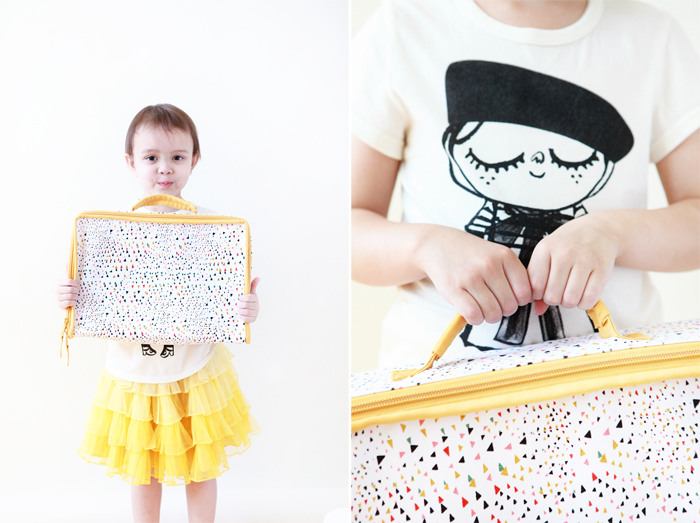 Later, after meeting the artist and designer behind the fabulous Lately Lily and after reading about Lily on her website, we saw that she carries a sunny little yellow suitcase around! Avery fell in love with Lily and her travels and also loved the idea of packing her suitcase just like Lily. With this tutu and a couple of pairs of these spec-tacular spectacles, Avery was ready for an afternoon of adventures. Thanks to Lately Lily for Avery's Bonjour Lily shirt and to The Land of Nod for supplying these great accessories for imaginary play (links: tutu, multi rainbow glasses, green bow glasses, suitcase). Stop by The Land of Nod at South Coast Plaza for Lately Lily day on Saturday, September 21st! Check out the fun details of the afternoon here.